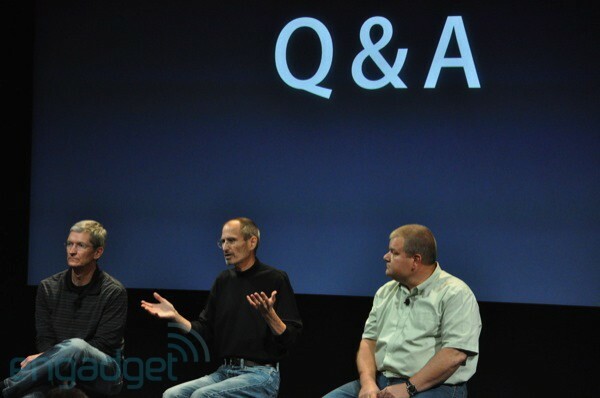 In response to a question at its press conference today about whether Apple could’ve done anything to avoid its antenna issues with the iPhone 4, Steve took the opportunity to rip on bigger rivals, saying that making a phone so big “you can’t get your hand around it” helps, but that “no one’s going to buy that.” We’re assuming he’s likely talking about the latest crop of 4-, 4.3- and 5-inch phones that include the Galaxy S series, the EVO 4G, Droid X, and Dell Streak, even going so far as to call them “Hummers” (we take it you don’t ever drive a Hummer, Steve?). Though ripping on the competition is to be expected, perhaps the more interesting takeaway here is that we can’t realistically expect an iPhone much bigger than the 3.5-inch display they use today — presumably that’ll all be reserved for iPad territory going forward. We personally don’t mind something with a little more screen real estate — but hey, maybe humans need to go through a few more cycles of evolutionary hand enlargement before Cupertino’s willing to capitulate. Stampa l'articolo Questo articolo è stato pubblicato da Camillo Sirianni il 16 luglio 2010 alle 21:18, ed è archiviato come iPhone. Puoi seguire i commenti a questo post attraverso RSS 2.0. Puoi pubblicare un commento o segnalare un trackback dal tuo sito.